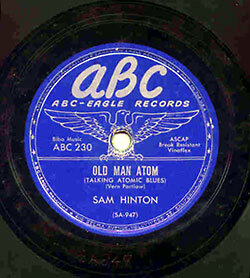 Sam recorded Old Man Atom in 1950 for ABC Eagle, a small independent label. Influential New York disc jockey Martin Block played the record on his show 'Make Believe Ballroom.' Overwhelming listener response prompted Columbia Records to acquire the rights for national distribution. From all indications, it promised to be one of the year's biggest novelty records. RCA Victor rush-released a cover version by the Sons of the Pioneers. Bing Crosby was reportedly ready to record Old Man Atom for Decca when right-wing organizations began attacking Columbia and RCA Victor for releasing a song that reflected a Communist ideology. Buckling under pressure, both Columbia and RCA Victor withdrew Old Man Atom from distribution. Old Man Atom is still in print as track #3 on Washington Square Memoirs: The Great Urban Folk Boom. I don't mean the Adam in the Bible datum. And when Einstein's scared, I'm scared. All men may be cremated equal. Hiroshima, Nagasaki -- Lordy, who'll be next. They all pitched in with overtime. Splittin' atoms, while the diplomats was splittin' hairs . . .
Hiroshima, Nagasaki -- they both went up the blue. Every darned atom that can't speak English. Flourishes in Utah, also Siberia. That is the question. . . If the world makes A-bombs, something's bound to bust. Like "Who gets there fustest with the mostest atoms,"
We got to stick together or disintegrate. Civilian international control of the atom -- one world or none. If you're gonna split atoms, well, you can't split ranks. You can't fence him in, he's just like air. You got to get with all the people in the world with you. "Peace in the world, or the world in pieces!"